Hi guys, long time no chat! I've had a super busy week, and I feel a huge emptiness in my heart today...I watched the Hunger Games 2 nights ago and I need to watch it over and over until I am content, haha! Today will be busy as well, but super fun and special! It's my husband Jon's 26th birthday! We're going out for sushi and drinks tonight with our favorite friends and family, so can't wait for that! Anyway, about a month ago my hubby bought me my first SugarPill products for my birthday and I was seriously stoked. I've been dying to get my hands on some SugarPill and I am so elated that theses are finally in my life. I got the Sweet Heart Palette, the Burning Heart Palette and a loose pigment in Stella. My order also came with a sample of Goldilux (now I know why everyone is crazy about it)! Get ready for lots of photos, this will be a long post! Both palettes came inside this ridiculously pretty box. They are so cute that I just had to keep them. I cannot throw them away! (Hoarder? Not really). This is the acutal packaging for the palettes. They are made of thick and sturdy cardboard that is very sleek and well made. Inside the Sweet Heart Palette, you get four HUGE pressed eyeshadows that are among the most pigmented I have ever tried. Net Wt. 4 grams / .14 oz. × 4, $34.00. As you can see, these are no joke. Crazy pigmentation and superb blendability for pressed shadows. These are swatched over bare skin (2 coats). Tako and Dollipop are both matte finishes, while Midori and Afterparty have a slight pearly-sheen. Dollipop is my favorite in this palette. I love Tako too, but it's a teeny bit on the chalky side. Still the best white I own though! The Burning Heart Palette just screams sunset/summer...doesn't it? It is absolutely gorgeous, and just like it's sister the Sweet Heart palette, it is equally as pigmented and all around amazing. I still cannot get over how amazing the quality and the pigmentation of these shadows are. 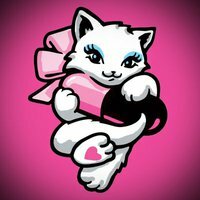 Why isn't SugarPill sold in Sephora? They would blow everyone out of the water. Net Wt. 4 grams / .14 oz. × 4, $34.00. Swatches are over bare skin, two coats. Stunning, right? I love how opaque these all are. Poison Plum has a slight pearly-sheen while the others are a matte finish. Butter Cupcake is pure love, it's my fave in this palette. I just wanna eat it! I also received one of their loose shadows, Stella. I have a soft spot for loose shadows and I am so glad I picked Stella. It is a galaxy in a container, so gorgeous. 4.5 grams, $12.00. The box is similar to the palettes, only with a slightly different design. Still really cute. They also have a sort rubbery feel to them. This loose shadow was pretty much made for me. It's a matte jet black base, with TONS of rainbow sparkles. I tried my best to capture the rainbow-ness going on, but you're just going to have to take my word for it, it is to die for. I have tried lots of different loose shadows, but nothing compares to the texture of this one. It blends so easily and has almost a butter-like consistency. LOVE. Left is applied wet, right is applied dry, no base. No base, left dry, right wet. As I mentioned earlier, I got a sample of Goldilux as well. One of the prettiest golds I've ever seen! This is also a loose shadow and has a smoother texture then Stella. I love this shade because it is really versatile and can be worn by anyone. And here is just a quick look I put together once I opened up my palettes. It's nothing special or unqiue, I simply wanted to try these babies out! I used Poison Plum and After Party on my lid, Stella in the crease and blended out with Dollipop. I have Butter Cupcake on my tearduct, Midori on the lower lid and Tako on my brow bone. Also, my last look was created with mostly SugarPill products as well. You can check that out HERE. I HIGHLY recommend giving SugarPill a shot if you have yet to...trust me, you need some in your life. 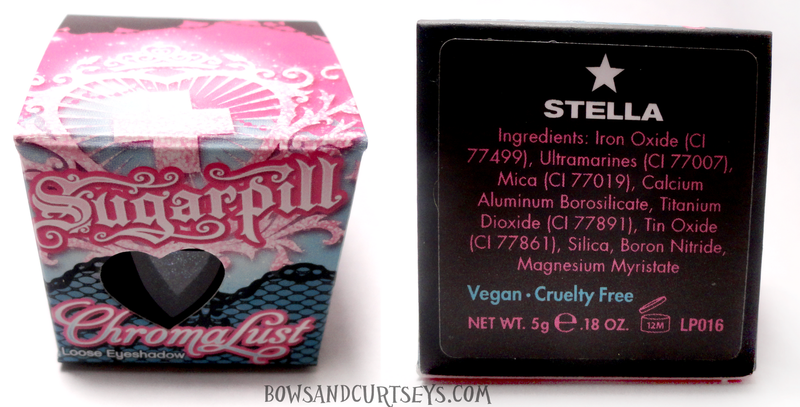 SugarPill is vegan and cruelty-free as well, which is a giant plus in my book. How did you like The Hunger Games? This is such a beautiful look! You are super talented to have came up with that off the top of your head.....now I want some Sugarpill! You're not a hoarder if you admit you collect it ;D I'm totally the same way! I'm glad I'm not the only one who couldn't throw away the box the palette came in!! How can you say that the look is nothing special or unqiue, it's simply stunning... 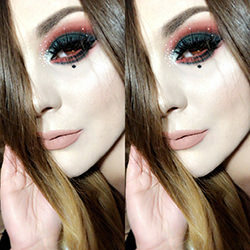 I really want to try out some Sugarpill now! Oh my God! I like these Colors and your Look! I'm glad you've finally got your hands on some Sugarpill! I love their stuff so much. And your look is nothing special? Disagree completely! I love love love the Sugar Pill pressed shadows! I can't wait to get more soon. Just found your blog and I love it! I'm following, would love to have you check out my blog as well!
" It's nothing special or unqiue .... " Ronnie, every look you ever post is GORGEOUS and always has something unique about it :-) I love the look you created using the two palettes. It's so beautiful! Amazing blog, absolutely love it. nothing unique??? yeah your mistaken.. :) Gorgeous!!! Stunning eye make up! I wonder if I can try something similar for my wedding look! Hi Ronnie, I just came across your blog and I love what you have going on here! I love this review and the swatches.